Competitors for Road to the Horse buckle down and polish their colt-starting skills before stepping into the arena at Kentucky Horse Park. With only one day before Road to the Horse kicks off at Kentucky Horse Park in Lexington, competitors are busy preparing and packing for the big competition. Though strategies may differ from horseman to horsewoman, one challenge has been the same across the board: finding time to get their hands on as many colts as possible prior to the event. Four-time Road to the Horse Champion Chris Cox says it’s important for the competitors to stay focused. Headlining the event are professional trainers Nick Dowers and Vicki Wilson, who will each start three Four Sixes colts over the course of three days, vying for the title and a check for $100,000. Wild Card competitors Ben Baldus, Wade Black and Booger Brown, will each start one Four Sixes colt for three days. The winner of the Wild Card Challenge earns a spot at next year’s RTTH. Nick Dowers: “I’ve tried to get my hands on a bunch of colts to brush up on my skills. This year, to brush up for Road to the Horse, I started all the colts myself, when usually I have help since I have a training business to run, too. Vicki Wilson: “We are at the busy end of our show jumping season so I have had very little time to do anything! In fact on Sunday I jumped off my competition horses and raced to catch the plane to Lexington! Ben Baldus: “In February I went to the Waggoner Ranch, where I used to be the head trainer, and had the opportunity to start 27 colts. I brought two helpers, Taylor Peters and AJ Black, and my wife, Cameron, who will be my pen wrangler, to get her more used to being around colts. Wade Black: “I prepared for Road to the Horse last night. 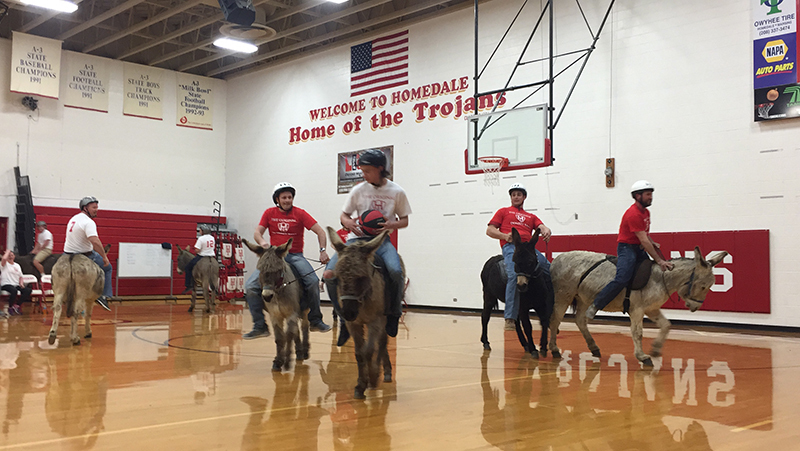 I rode in FFA Donkey Basketball. My cousin roped me into it. We rode donkeys in a gym and had to try and make baskets. My basketball skills aren’t very good, and I only made two baskets. The donkeys weren’t going anywhere we wanted. By the end, I had my donkey pretty suppled up, so I’m proud of that. Booger Brown: “We’ve been preparing for the sixth season of my show, The Cowboy Way, so my plate’s been full! When I found out I was selected as a Wild Card competitor, it was like ‘Johnny, get your gun!’ I got on the horn and told everyone I knew to bring me colts, and I’d start them for free. I ended up with about 20 colts and worked them in the round pen.